I'm Sharing The Love of Distress Inks with a couple of cards for the Winnie & Walter blog. My first card is for the Ombre Challenge. I used W&W's The Big, The Bold and The Happy cut file for the journaling card and inked it up in Spun Sugar, Worn Lipstick, Picked Raspberry and Seedless Preserves. I added some paint specks of Heidi Swapp Gold Color Shine and a few stars from Memory Box. My next card is for the Stencil Challenge and it is....well....busy and bright. I thought I would mix some patterns and I'm not happy with the outcome but crafting is all about experimentation right? I cut a couple of tags from W&W's Daily Grind Collection: Holiday Mint Add-On. I cut the Diagonal Stripe Journaling Card from W&W's Cut File Basics vol. 1 to make a stencil and create the stripy lines in Squeezed Lemonade and Festive Berries on the tag. The "hello" is from the same cut file as the first card and I inked it up in Black Soot, added some sparkle with a Wink of Stella pen and a layer of Glossy Accents. The background is the Mini Tiny Circles Stencil from Crafters Workshop inked in Peacock Feathers. I also dyed the seam binding with Peacock Feathers. Thanks for visiting and hope you manage to get a bit inky this weekend! Love the gradient colors on your first card, Sue, and yes, the 2nd card is bright, but I think the black grounds it all and pulls everything together. Nicely done! Wonderful cards! Love the inking on the first and the color combo, and love that huge hello with the glossy accents on the second! 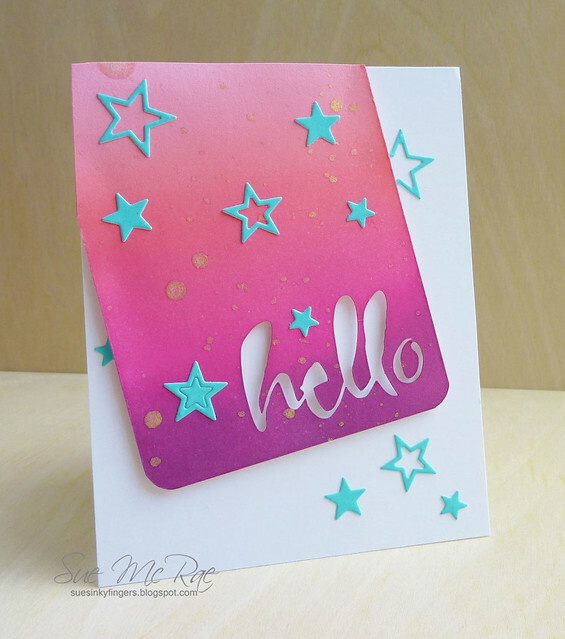 The ombre effect on your first card is gorgeous, Sue! I love all the shades of pink/purple and the stars are fabulous! Love the specks of gold, too! Your stenciled background on your 2nd card is amazing, and adding sparkle and shine to your sentiment is the perfect touch! Love them both!